Prince’s best songs ring with lyricism, surprise and innovation that shimmer close to perfection. That perfection — or the drive for it — might also be the reason he died without a will. Advisors to the wealthy and ambitious say that unraveling the relentless reflex for perfection is the key to drawing type A personalities to the planning table. They are too busy to slow down, least of all to plan for dying. Advanced planners and advisors in the growing field of wealth whisperers are well aware of the deeper currents under the usual objections. Typically, agents and advisors blame the dark subject itself — Death. Let’s face it, dying is a little bit of a downer. But an advisor can be pretty sure the client has heard the dire warnings before. And that client may have already been at the foot of the estate-planning path previously before slipping away. So, what’s keeping the client from taking steps in the right direction? That’s the applied art of estate planning. Jamie Bush has been helping families manage multigenerational wealth for nearly 40 years as the principal of Bush & Co., a financial services firm in Boston. He not only has seen generations of clients but the evolution of advising for insurance and finance. But he sees that typical estate-planning specialists still have a one-track mind with clients. The sophisticated client likely has heard it before. So, Bush has learned to approach estate planning through other means. For example, clients might not have thought about what happens if they become injured and can’t speak for themselves. That leads to a discussion about health-care proxies, which can expand to talking about other what-ifs the clients might not have considered. That’s important because the clients already have thought about the consequences of not having a will. Despite all his experience, Bush sometimes will need to turn to a professional who can uncover deeper motivations. Karen Weisgerber is a wealth psychologist with Cambium Consulting in Waban, Mass., who works with advisors and clients on how families handle wealth. The first hurdle is the awesome finality and that does not necessarily mean the person’s death. Weisgerber said the planning itself has the feeling of forever about it — pretty weighty stuff. But it doesn’t have to be. And those are the few who have gone through the long process of developing estate-planning documents. Often, procrastinating perfectionists haven’t even started. It helps if clients know if there is a step-by-step process that will lead them through the tough decisions. Weisgerber also said that awareness helps relieve the client of the fear that the advisor is only looking for an angle to make a sale. Her firm lets clients know that there is a process in which they get to choose what is best for them. A map of the maze offers perfectionists a sense of control. But more on developing plans later. 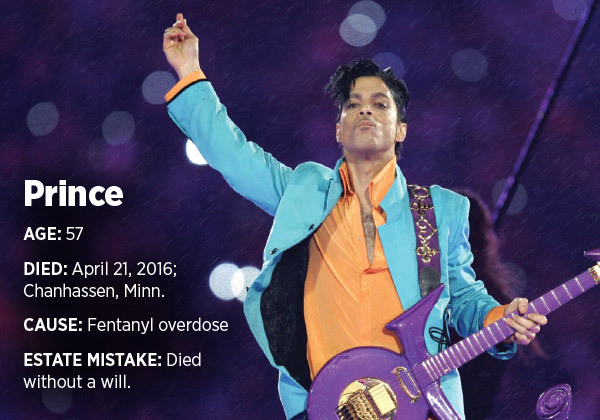 We are still faced with opening the door with people like Prince who are too busy to slow down for estate-planning. That job becomes even harder when dealing with those who come into significant wealth early in life. Sure, people of a certain age can think of 57-year-old Prince as young but then there are sports stars like Jose Fernandez. At a mere 24, Fernandez was already a Florida Marlins sensation with a blazing fastball and crafty curveball. He had already cheated death in shoddy boats trying to reach the United States from Cuba two times before finally reaching Texas on the third attempt. In that voyage, he dove into a turbulent sea to rescue his mother. 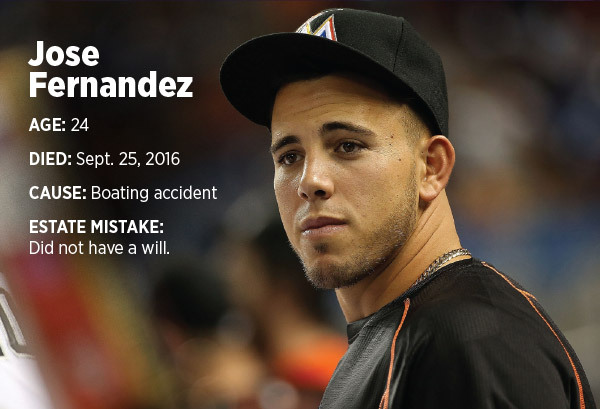 But he would die off Miami in another boat — a 32-foot SeaVee speedboat that flipped during a 3 a.m. careen home from a bar on Sept. 25, 2016. He had everything to live for, a promising career and a baby on the way with his girlfriend. Planning for the what-ifs was probably the furthest thing from his mind and he did not leave a will. His mother and girlfriend have had to petition the court to try to direct his $2 to $3 million estate, which is also facing two lawsuits seeking $2 million each for the families of two other people killed in the accident. The effects of not having a will can reverberate for generations, especially when it involves significant assets. And when it is Pablo Picasso, even a single piece of art can be worth a vast estate all by itself. In 2015, a painting of his sold for $179 million, the record at the time for a piece of art. 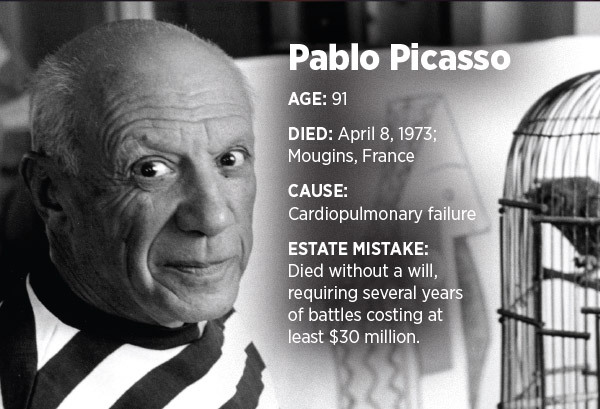 Picasso was known during his 91 years as a breaker of rules and traditions. Estate planning was no different. When he died in 1973, he left 45,000 pieces of art, several homes, $4.5 million in cash, $1.3 million in gold, an undisclosed value of stocks and bonds, a wife, ex-wives, mistresses, legitimate and illegitimate children and grandchildren — but no will. It took six years and $30 million just to straighten out who got what. And that was just Act One of the drama to come, which is still unfolding nearly 45 years later. A French court did what many attorneys would advise against when it named one of Picasso’s sons as the legal administrator of the estate. Claude Picasso leads the organization that controls what happens with the Picasso name and images, including rights. Needless to say, some family members are not happy about that. That was pretty much the guaranteed result of that arrangement, said Avi Z. Kestenbaum, a trusts and estates attorney and partner with Meltzer & Lippe, a top firm based in Mineola, N.Y. But even in cases where there is a will, there is still a way for heirs to fight over the details — when the details are not spelled out. That was the case with Audrey Hepburn. 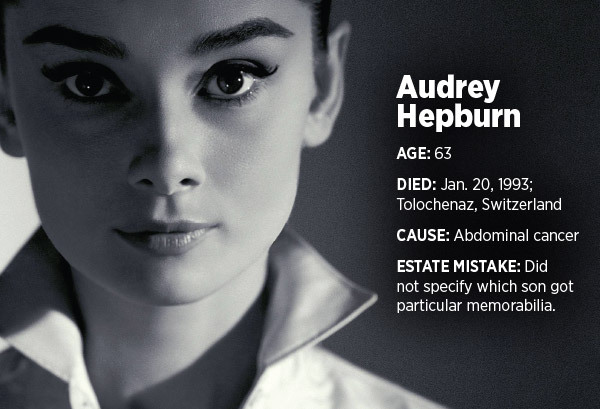 Hepburn had estate-planning in place when she died at a relatively young age of 63 in 1993 from a rare abdominal cancer. She was known for her film roles, particularly in Breakfast at Tiffany’s. But her most enduring legacy might have been as a style icon, which is why her trove of memorabilia, including clothing, is of considerable collector interest today. It is also why her two sons haven’t been able to divide the contents of her collection, which the will told them to split equitably. Nearly 25 years after her death, the sons have only recently come to terms on how to even talk about the material. Kestenbaum said he recommends a four-step process to avoid conflicts among beneficiaries. Don’t put people whom the beneficiaries don’t like in a position of power over them. Just putting somebody in a position of power over them is going to make them angry. “That way, it’s not your evil stepmother or your evil sister or your evil brother who’s your executor and trustee,” he said. Use as many neutral people as possible. Don’t leave assets for people jointly. Clients can discuss the planning with the loved ones before they die, so they know what to expect and what the wishes are. To help with that last rule, if clients are not up to having that conversation, they don’t have to have it while they are still living. Kestenbaum’s firm has been recommending using a document as a tool. But this is all predicated on getting clients to the estate drawing board. How does an advisor pull in the focus of clients too young or too busy to plan? Sometimes Kestenbaum turns to a particular financial and insurance advisor who has been able to set a client’s estate planning on the rails. Brutal honesty is Thomas J. Fanning’s suggestion. As the founder of Heritage Strategies, with offices in Manhattan, Miami and Long Island, he’s helped wealthy families get their estates and life insurance straight since 1990. With clients like Prince, Fanning says it pays to be direct. Fanning recalled how being blunt helped a billionaire overcome his reluctance to plan his estate and rehabilitate his bratty kids at the same time. He followed that bowlful of tough with a dash of love. “‘I’m not trying to hurt you. I’m just trying to make a point here,’” Fanning said before walking to a white board. He wrote “Current Situation” on the left side and “Revised” on the right. In the middle, he listed “IRS,” “Family” and “Charity.” Under the Current Situation side, he wrote $500 million next to IRS and then next to Family. Next to Charity, he wrote zero. Then he drew a box around “Charity” and wrote “Foundation” on the right. As Weisgerber does and suggests, Fanning has a process he can hand clients. In fact, he can literally hand it to them because it is a book he and others in his practice put together containing all the pieces of complete estate planning. Fanning was inspired to produce the Heritage Book thinking about his father’s structural steel fabrication shop, where huge structures came together from plans. So, he thought he should make a book of templates that break down the pieces that go into sturdy, substantial estates. Stephan R. Leimberg, CEO of Leimberg and LeClair, an estate and financial planning software company, is an attorney and former advisor who has had experience with wealthy clients. Now he is mostly coaching other advisors on an approach similar to Fanning’s. Don’t focus on the will and the documents, but instead on a higher purpose — the dream. The client can use that stature to bring local businesses together to help the community through the project. The dream can grow into something far larger. But projects like that require dedicated capital. If clients are not convinced they can devote their working capital for the project, life insurance creates a pool large enough to make the engine go. Only a sliver of their income would be needed to sustain the dream for generations. Another theme running through the stories of estates gone wrong is infighting among heirs. 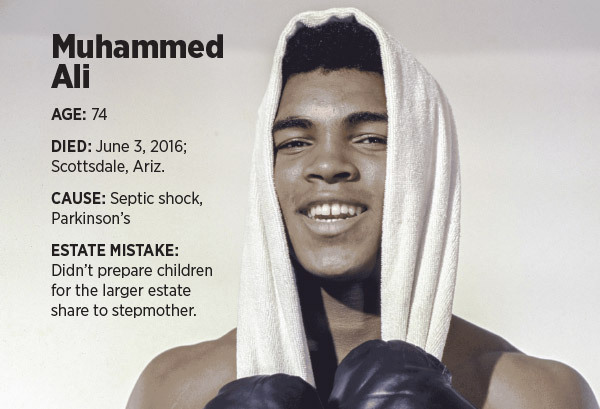 In the case of Muhammad Ali, when the world champion boxer died of septic shock at 74, he had several children from different relationships. He was living in Arizona with a wife who helped him through his difficulties with Parkinson’s disease, but was a stepmother to nine children. Most of them were not happy to learn she got a double share of the $80 million estate, $12 million opposed to their $6 million. One solution to the problem is to prepare the heirs before the time of death by telling them of the plan and the reasoning. Another is life insurance. That means the client can direct a charity to be quiet about the gift or to publicize it. It also keeps the public from knowing how much, if anything, that individuals receive. That even means family members don’t have to be aware of what other family members received. Then there is the issue of identifying who is in fact family, as in the curious case of B.B. King. The legendary bluesman was perpetually on the road, but was not necessarily lonely. Since his death, 15 children of 15 different women have come forward to challenge the estate. King apparently not only did not disavow any of them during his life but also was quite generous with them. However, since his death, the thrill, or at least the money, is gone. They are demanding their share of the estate, reportedly worth up to $40 million. Some of the claimants even said King had assured them they would be provided for. The story got even more curious because none of the 15 women were his two wives. Reportedly, he didn’t have children with his wives because he had too low of a sperm count. 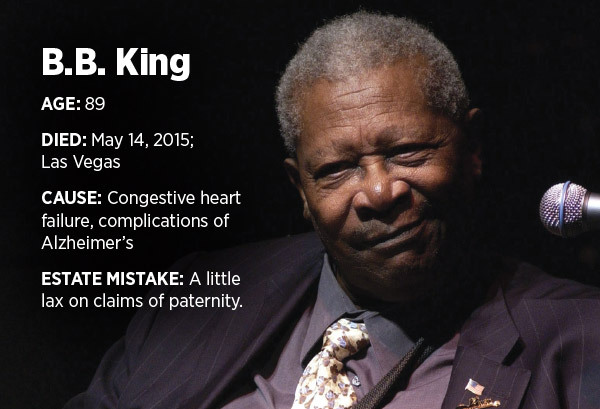 So, why wouldn’t King have disavowed the extramarital claims? Janice Forgays, an attorney with PRW Wealth Management in Quincy, Mass., has an idea. If he wanted to be sure they were included in the estate and spare everybody the fight, he had the opportunity to spell it out. Some of the would-be heirs might claim King wanted to provide for them, but the courts need it in writing. A well-drafted statement of intent would prevent many of these problems, Forgays said, even if it is not with the estate-planning documents. The next crucial step is to make sure the documents are updated. 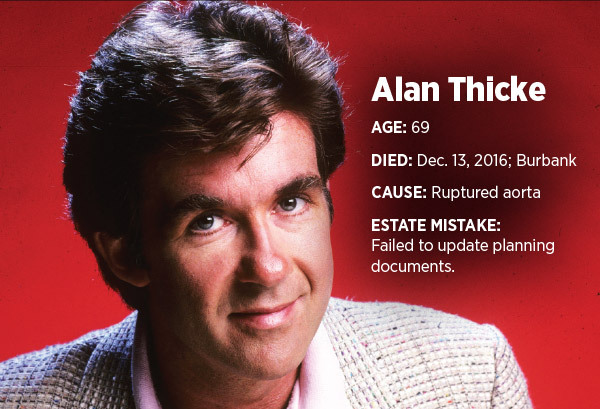 That was the apparent issue with Alan Thicke’s estate. The sitcom dad died at 69 of a ruptured aorta while attending a hockey game with his younger son, Carter. The 19-year-old was devastated by his father’s sudden death, but had another surprise when details of the estate plan came out. Instead of naming his older son, Robin, as Carter’s guardian, Thicke named his own brother. But the plan was 10 years old and had not been revisited. The brothers claim that their father would have decided differently if he had updated his planning. Forgays said it is up to advisors to make certain clients are up-to-date. Part of the issue is that the will and other documents are transactional. And that is how attorneys work, Forgays said. They are not going to monitor that unless they are paid for it. 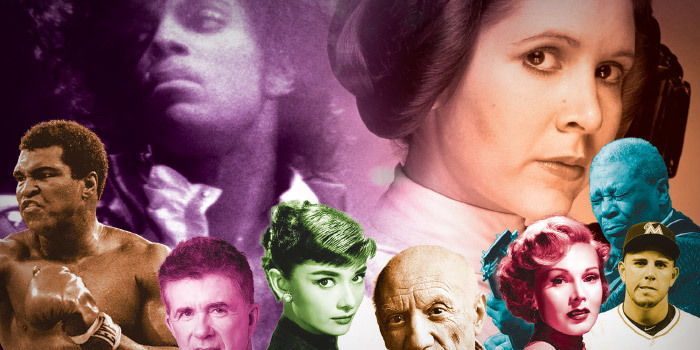 Carrie Fisher’s estate might be facing a roadblock. When she died of a heart attack at age 60 a few days after Christmas last year, she had a pending lawsuit. 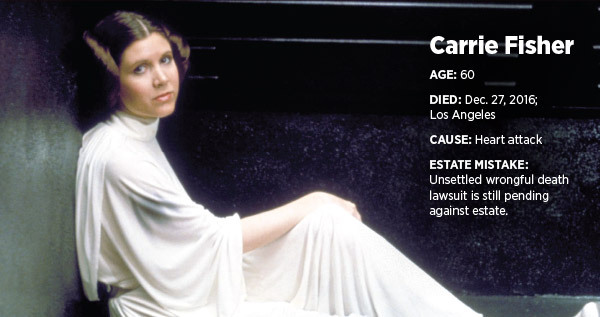 The Star Wars actress and author was named in a lawsuit over the heroin overdose death of a 21-year-old actress who lived on Fisher’s estate for a period. The actress’ mother is pressing the lawsuit despite Fisher’s death. It is unlikely to be resolved before the estate is settled, so the case is likely to hold up the disbursing of money. Beneficiaries might get an allowance in the near term or nothing until it is resolved. So, just who is first in line? According to Forgays, it’s the IRS. Then it’s administrative costs, which are any taxes and services, such as advisors and attorneys. Then it’s primary beneficiaries who have special bequests. Last would be residual beneficiaries. 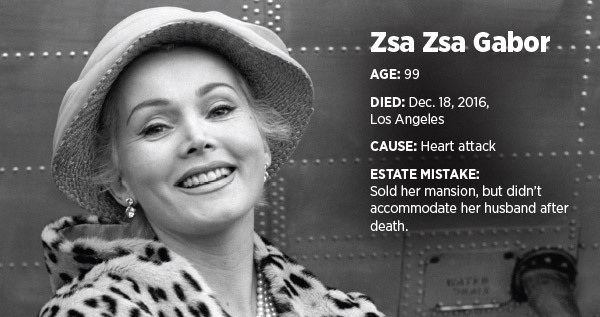 Zsa Zsa Gabor’s husband definitely ended up at the end of the line. When Gabor died in December at the age of 99, it was an eviction notice for Frederic Prinz von Anhalt, husband No. 9. That’s because Gabor had sold her Bel Air mansion in a “life estate” deal, which means she and her husband could live there as long as she was living. Even though her husband was a relatively youthful 71, they had not planned for what would happen next. That is up to advisors to think through the scenarios, said Kestenbaum, the planning lawyer from New York. In that case, it could have been an advisor not taking in the whole picture, which often can happen.